For people looking for warehouse clearance in Sydney, look no further than our Sydney warehouse clearance services. We are professionals in rubbish removal and waste disposal, and therefore a natural choice when it comes to warehouse clearance contracts. We operate all over Sydney, carrying out all sorts of building clearances and rubbish removal tasks, therefore we consider ourselves the best around for warehouse clearances in Sydney. No job is too big or too small when it comes to us clearing out the rubbish. If you are moving your warehouse business, give us a call, and leave all the clearing out to us. We can remove paper and cardboard, boxes, crates, old structures, fixtures and fittings, old appliances, obsolete stock and so on. We provide all the labour, all the transport, and all the facilities required in order to dispose of or recycle the rubbish we remove. We are complete professionals when it comes to all the tasks we undertake, and our warehouse clearance services are no different. Businesses not only use our warehouse clearance services when moving, they also use us to help with end of season clear outs, as well as refurbishment preparation. 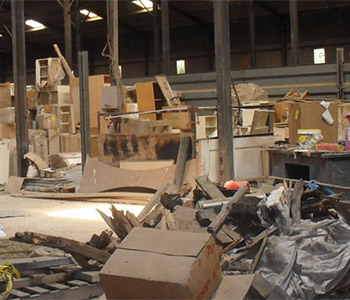 We have the man power to clear even the largest warehouses quickly, and dispose of all rubbish effortlessly. Our many years experience in the waste clearance industry means that we know the best way to tackle a job in order to get it done in the best way in the quickest time – we appreciate time is money, for all of us. If you are looking for warehouse clearance in Sydney, get in touch with one of our customer service team and request a free estimate, We are always happy to help, give advice, and provide a competitive quote for any work enquired about.